Spontaneous Euphoria: Tea Party entry with IMAGES! The theme was obviously very feminine and floral. I used candles and pink, yellow, and white flowers to accentuate the table. I also placed jellybeans and marshmallows in little gahwa (Arabic coffee) cups and scattered them around the table. The cupcake with the crown was the birthday girl's! 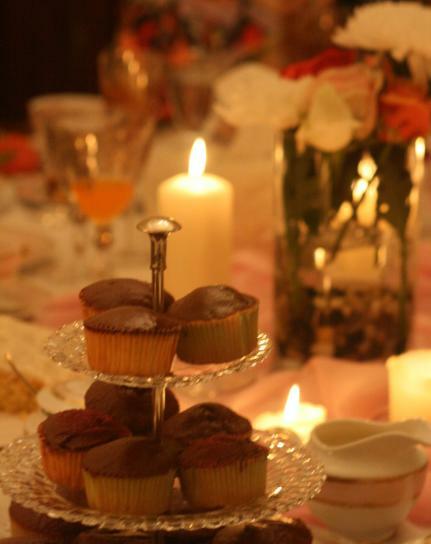 I placed one cupcake on every plate. You can see what I've done to the chair there.. I gently tied some pastel coloured chiffon to it and placed a rose in the knot. I also gave each person one rose on their plate along with the cupcake. What a gorgeous tea party!